Be the first to share your favorite memory, photo or story of Marielle. This memorial page is dedicated for family, friends and future generations to celebrate the life of their loved one. 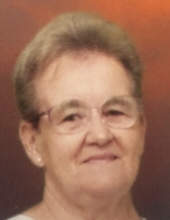 Marielle D. Smith, 81, of Willimantic, passed away Friday February 22, 2019 at her home. She was the daughter of the late Achille and Laurette (Raiche) Roy. Born on October 17, 1937 in Garthby Quebec, Canada, she lived in Willimantic for the last 59 years. She worked as a machine operator at Brownell for many years until her retirement. She was also a member of St. Mary’s Church in Willimantic. She is survived by her sisters, Therese Roy of Willimantic, and Colette Lessard of Thetford Mines Quebec , Canada; brothers, Roger Roy of Garthby Quebec Canada, Ferdinand Roy of OH and Germaine Roy of FL; and numerous nieces and nephews. She was predeceased by her sisters, Jaetane Jackson and Jeanete Roy. Funeral services will be held Friday March 1, 2019 with a Mass of Christian Burial at 11AM directly at St. Mary’s Church 57 Valley St, Willimantic. Burial will be in St. Joseph Cemetery, Windham. There are no calling hours. In lieu of flowers, donations may be made to St. Mary’s Church 80 Maple Ave, Willimantic, CT. 06226. To send an online expression of sympathy, please visit www.baconfh.com. Bacon Funeral Home 71 Prospect St, Willimantic is serving the family. To send flowers or a remembrance gift to the family of Marielle D. Smith, please visit our Tribute Store. "Email Address" would like to share the life celebration of Marielle D. Smith. Click on the "link" to go to share a favorite memory or leave a condolence message for the family.